Dogs are highly vulnerable to skin problems, so it is important to maintain a daily skin care regime as a preventative measure. Daily skin care is also the most effective way to treat any problems that do arise. It should be remembered that healthy looking skin can often mask latent problems. 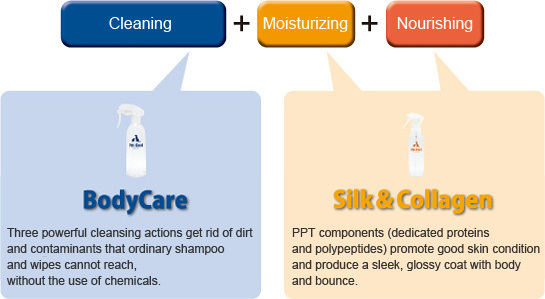 A daily skin care routine using Pet-Cool products can help to keep skin problems at bay. What does good skin care involve? The aim of skin care is to maintain the skin in good condition by keeping it clean, nourished and moisturized, without the use of pharmacotherapy agents or chemicals. All dogs are susceptible to skin problems such as seborrhea and eczema. It is important to wash off excess sebum and follow up with regular moisturizing with a good-quality oil-free humectant to keep the skin in good condition. Seborrhea* and eczema are particularly common in breeds such as Shih tzu and Beagle. These conditions are generally attributed to excess sebum, so it is important to maintain good skin condition by washing off sebum and moisturizing regularly with a good-quality oil-free humectant. * Seborrhea can be oily, where the skin is sticky to the touch, or dry, where the skin flakes off. Poodles have delicate skin that is prone to developing problems. This type of skin requires gentle washing with a low-irritant cleanser. Dachshunds typically have dry skin that requires special attention to prevent skin problems. For best results, the skin should be washed using a low-irritant cleanser then treated with a good-quality moisturizer. Short-haired breeds such as these typically have delicate skin that does not react well to ordinary shampoos and standard oil-based moisturizers. For this reason it is important to use a low-irritant cleanser and non-greasy moisturizer. Cocker spaniels have delicate skin that is susceptible to seborrhea. Excess sebum in the skin should be washed off gently with a mild cleanser rather powerful cleaning agents. Breeds with short, wiry hair tend to have inadequate pore barriers and are commonly afflicted with folliculoma*. It is important to keep the skin clean using a low-irritant cleanser. * A skin disease caused by staphylococcal infection in individual hair follicles at the base of the pore where the chorion resides. In breeds with no body hair, black spots on the skin usually indicate that the pores (known as splines*) are blocked by an organic substance that can lead to skin disease. Hairless skin is extremely delicate and for this reason powerful cleaning agents cannot be used. The only solution is to remove splines using a gentle cleanser, then moisturize the skin with a cosmetic-grade moisturizer. * Caused by sebum and keratin secreted by the hair glands solidifying inside the pore. Often the material oxidizes on the skin surface, taking on a black appearance.